"Encantadora" redirects here. For the song by Yandel, see Encantadora (song). 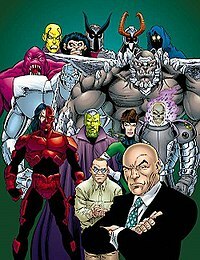 Various enemies of Superman, as they appear on the cover of Superman Villains: Secret Files and Origins #1 (June 1998, art by Dan Jurgens). This is a list of fictional supervillains appearing in DC Comics who are or have been enemies of the superhero Superman. Several of Superman's rogues (most notably Darkseid and Brainiac) are or have been foes of the Justice League of America as well. Unlike most heroes, Superman's adversaries exist in every known capacity; humans, metahumans, androids, sorcerers, empowered animals, other aliens (such as Kryptonians), mythical/supernatural creatures, and even deities. The Anti-Monitor Crisis on Infinite Earths #2 (May 1985) The villain behind Crisis on Infinite Earths, the Anti-Monitor is one of the most powerful beings in the DC multiverse. Atlas 1st Issue Special #1 (April 1975) A former one-shot Jack Kirby character recently revamped as a morally ambiguous antihero, Atlas has a crystal which gives him strength to rival Superman. The Atomic Skull Superman #303 (September 1976) Albert Michaels was given radiation treatments that gave him atomic eye-blasts and worked his way up from an agent of SKULL to becoming the organization's leader. Adventures of Superman #483 (October 1991) Joseph Martin's superhuman powers manifested after exposure to the Dominators' gene-bomb, the film buff began to hallucinate that he was a 1930s movie hero called the Atomic Skull and that Superman was his nemesis. Bizarro Superboy #68 (October 1958) Bizarro was created when Superboy was exposed to a "duplicating ray" and was later destroyed in the same story. Action Comics #254 (July 1959) Lex Luthor exposed Kal-El, now Superman, to another duplicating ray, this time creating an adult Bizarro. This Bizarro later created a Bizarro Lois Lane and left with her into space. In accordance with the science fiction concepts of Superman stories of the era, Bizarro relocated to "the Bizarro World," a cubical planet called Htrae (Earth spelled backwards) which operated under "Bizarro logic" (e.g., it was a crime to do anything good or right) and which Bizarro populated with duplicates of himself and Bizarro Lois Lane, as well as Bizarro versions of Superman’s supporting cast and the other DC heroes and villains. The Man of Steel #5 (December 1986) Bizarro was a flawed clone created by Lex Luthor's staff of scientists. Superman (vol. 2) #160 (September 2000) Post-Crisis, another Bizarro was created when the Joker conned Mr. Mxyzptlk out of 99% of his powers and created a Bizarro World. Black Zero (supervillain) Superman #205 (1968) The original Black Zero was a space saboteur who destroyed planets for pay, and was the man responsible for destroying Krypton. He was erased from existence following Crisis on Infinite Earths. Superboy (vol. 4) #61 In an alternate reality in which Superman never returned from the dead, Superboy became the new Black Zero and took control of Earth by force. Bloodsport Superman (vol. 2) #4 (April 1987) A gun-toting mercenary with Kryptonite bullets. Adventures of Superman #506 (November 1993) A white supremacist, Alex Trent uses similar technology to the first Bloodsport. Brainiac Action Comics #242 (July 1958) Most incarnations depict Brainiac (alias Vril Dox) as a bald, green-skinned alien cyborg or android from the planet Colu and one of the most dangerous villains in the DC universe, capable of possessing others, inventing extremely advanced weaponry (such as force fields and shrinking rays), physically matching or overpowering Superman, creating and manipulating computer systems and exerting some control over time and space. Bruno Mannheim Superman's Pal Jimmy Olsen #139 (July 1971) Mannheim is one of Metropolis' most powerful gangsters, the leader of Intergang. The Composite Superman World's Finest Comics #142 (June 1964) An out-of-work diver, Joseph Meach gained the combined powers of the Legion of Super-Heroes after being struck by the energy discharge of their statues. He then desired to defeat Superman and Batman. However the effects eventually wear off. Later they are given back by an alien whose father was imprisoned by the two heroes, but when he turned back he sacrificed himself to save Superman and Batman from the Magna-Gun that the alien had shot at them. Conduit Superman the Man of Steel #0 (October 1994) A Bully and rival of Clark Kent's while growing up, Kenny Braverman was exposed to kryptonite radiation as a baby and so became a living kryptonite battery. Obsessed with coming in second to Clark and killing both Clark and Superman, he has learned they are one and the same. He is currently deceased. The Cyborg Superman Adventures of Superman #466 (May 1990) Hank Henshaw is an astronaut who died as a result of a doomed mission onboard space shuttle Excalibur. Because Superman failed to save him, Hank Henshaw blames him for the loss of his original body, as well as the death of his wife. Reduced to a formless entity that inhabits mechanical bodies, the Cyborg desires to cause Superman equal pain. He masqueraded as a resurrected Superman after the hero's apparent death, claiming to be the result of Superman's remains being reconstructed into cybernetic form. The ruse was a tremendous success, even earning the Cyborg an endorsement from the U.S. President as the "true" Superman. Hank Henshaw betrayed those whose lives he was entrusted with when he obliterated Coast City with the help of Mongul; this event led to Green Lantern Hal Jordan's mental breakdown and later transformation into Parallax. Later he became a member of the Sinestro Corps, still continuing to mockingly bear Superman's insignia. Action Comics #252 (May 1959) Zor-El was introduced as the new Cyborg Superman following the New 52 relaunch of the DC Universe. Zor-El was rescued from Krypton's destruction by Brainiac and was reconfigured as a cyborg to be his scout for looking for stronger species in the universe. Darkseid Superman's Pal Jimmy Olsen #134 (November 1970) Uxas, son of Heggra, alien dictator of the planet Apokolips. As with gods in other mythologies, Darkseid is incredibly powerful, but cannot escape his ultimate destiny. It has been foretold that Darkseid will meet his final defeat at the hands of his son, Orion, in a cataclysmic battle in the fiery Armaghetto of Apokolips. According to writer Mark Evanier, Jack Kirby modeled Darkseid on actor Jack Palance. Doomsday Superman the Man of Steel #18 (November 1992) The creature who killed Superman in a titanic battle that also resulted in Doomsday's death, although Doomsday comes back to life every time he dies, albeit more powerful. Created by an ancient genetic experiment on Krypton. The Eradicator Action Comics Annual #2 (1989) A powerful artificial intelligence from Krypton, the Eradicator program initially sought to transform and terraform Earth into a New Krypton. Since then, it has merged with human scientist David Conner, serving as a replacement Superman after the Man of Steel's apparent death and later as an ally to Superman himself. Faora Hu-Ul Action Comics #471 (May 1977) A Kryptonian martial artist and man-hater who was sent to the Phantom Zone for murdering several men, she is able to beat Superman using her knowledge of Klurkor, a Kryptonian martial art enabling the user to immobilize an opponent via pressure points (this character was used as the basis of General Zod's lover, Zaora). General Zod Adventure Comics #283 (April 1961) General Dru-Zod is one of Superman's more prominent enemies. Once the Military Director of the Kryptonian Space Center, Zod had personally known Jor-El when he was an aspiring scientist. Zod attempted to take over Krypton using a machine that produced Bizarro-like duplicates during a period of turmoil caused by the termination of the space program; he was sentenced to the Phantom Zone for 40 years for his crimes. Zod was first released by Kal-El (during his Superboy career) when his term of imprisonment was up. However, he attempted to conquer Earth with powers gained under its yellow sun. Zod was sent back into the Phantom Zone, occasionally escaping to target Superman. Adventures of Superman #444 (September 1988) A General Zod based on the previous version created by the Time Trapper in a pocket dimension. Superman (vol. 2) #166 (January 2001) Head of the Kryptonian military in an alternate reality created by Brainiac 13. Action Comics #779 (July 2001) A Russian child that during an experiment developed powers similar to Superman, but where Zod gains power from red sunlight and becomes weak in yellow. He made contact with an otherworldly Zod that inspired him to face Superman. Superman (vol. 2) #204 (June 2004) Created from the artificial Metropia constructed by Superman that claimed to be from Krypton. Action Comics #845 (January 2007) Following Jor-El's belief that Krypton was doomed and attempted to usurp the ruling council, Zod and his compatriots Non and Ursa were captured and sentenced to the Phantom Zone with Jor-El their jailer. Having escaped the Phantom Zone with his allies, Zod's new objective is to reclaim his son, Lor-Zod, who is currently in Superman and Lois Lane's custody (under the alias of "Chris Kent)." Gog The Kingdom #1 (February 1999) In a possible future timeline, a boy called William was the sole survivor of the destruction of Kansas in a nuclear blast. Saved by Superman, he came to view the Man of Steel as a savior and became a minister of a church devoted to him. When Superman tried to correct this misguided view, William came to see him instead as a demon whose failure led to Kansas' destruction. Empowered by the cosmic beings known as the Quintessence, Gog has traveled across the dimensions of Hypertime, slaying versions of Superman wherever he finds them. Imperiex Superman #153 (February 2000) An all-powerful force of nature whose purpose is destroying galaxies, planning to create a new universe. Eventually, Superman, Steel, and Darkseid stopped Imperiex by using Doomsday as an ally, along with a powerful weapon called the Entropy Aegis. Intergang Superman's Pal Jimmy Olsen #133 (October 1970) A nationwide organized crime syndicate armed with weapons supplied in part by Darkseid, led by Bruno Mannheim. Jax-Ur (Pre-Crisis) Adventure Comics #289 (October 1961) Jax-Ur was an amoral and criminally deviant scientist on the planet Krypton. He was imprisoned in the Phantom Zone for destroying Wegthor, one of the Krypton's inhabited (population: 500) moons while experimenting with a nuclear warhead-equipped rocket. Jax-Ur's intention was to launch and test-fire it against a passing space rock. If this test proved successful, Jax-Ur would then commence the build-up of a massive personal nuclear arsenal with which he would overthrow the Kryptonian government and place the entire planet under his dominion (in the World of Krypton miniseries, he is shown test-launching a nuclear missile, intended to destroy a space rock, but a collision with a spaceship piloted by Jor-El sent it off-course). Because of this, space travel was forbidden. He calls himself "the worst criminal in the Phantom Zone". His sentence for his act of mass murder is life imprisonment. In his first appearance, he managed to escape from the Phantom Zone and posed as a super-powered version of Jonathan Kent. Superboy eventually sent Jax-Ur back to the Phantom Zone. Most of his later Silver Age appearances show him in his ghostly Phantom Zone form. Jax-Ur did not appear after the Crisis on Infinite Earths for some time, as until the recent appearance of Supergirl there was a rule that no Kryptonians survived except Superman. However, in one story he shows some honour, as he is released to help Superman defeat a criminal who caused Krypton's destruction and allows himself to be sent back. (Post-Crisis) Action Comics #846 (February 2007) He is one of the criminals unleashed from the Phantom Zone by Zod. In the current continuity, Jax-Ur destroyed Krypton's moon during an attempt at interstellar space travel. When the moon was destroyed, Brainiac became aware of Krypton and attacked Kandor, killing millions and shrinking the city, then placing it into a bottle. Jax-Ur subsequently became the first prisoner banished to the Phantom Zone. Jax-Ur is shown to be of the Science Guild, is bald and has one eye. He is part of General Zod's sleeper agents on Earth. He is currently employed by S.T.A.R. Labs as a scientist. Jax-Ur appeared in Superman: The Animated Series, where he was voiced by Ron Perlman. He was portrayed more like Zod, a military genius who had attempted to overthrow the Science Council. His co-conspirator, and possible lover, is a beautiful Kryptonian female with long white hair named Mala (based on Ursa and Faora). The Kryptonite Man Superboy #83 (September 1960) A teenage delinquent who passed through a cloud of kryptonite and gained superpowers. Originally known as the Kryptonite Kid, he changed his name to the Kryptonite Man after reaching adulthood. Superman (vol. 2) #43 (May 1990) A clone of Superman mutated by Kryptonite exposure created by Simyan and Mokkari. Superman/Batman #20 (December 2005) An energy being formed from the latent energy of Major Force combining with the energy from the kryptonite meteor that Captain Atom sacrificed himself to keep it from destroying the Earth. This being could hop between bodies, taking a body over and emanate kryptonite radiation. Superman #650 (May 2006) A scientist looking for a way to turn kryptonite into a fuel source; he arrogantly ignores any dangers and is turned into the Kryptonite Man. Lex Luthor Action Comics #23 (May 1940) Superman's archenemy, and the consummate evil genius. He continues to play different roles in various Superman comics and media. In his classic Silver Age incarnation, Lex Luthor and Superman were once friends, but a lab accident indirectly caused by Superman (then Superboy) caused Lex's hair to fall out completely. This event causes Luthor to snap and become a dangerous criminal who plots the destruction of Superman. In the modern era, Lex Luthor was re-envisioned as a wealthy CEO/scientist who hides his sociopathic tendencies behind a mask of philanthropy. Although beloved by the people of Metropolis for his many public works, Superman knows the truth. In the mainstream comic series, Luthor eventually manipulates his way to the US Presidency, but is forcibly unseated from office by Superman and the Justice League. Lobo Omega Men #3 (June 1983) A bounty hunter, the last member of the alien Czarnian race. Metallo Action Comics #252 (May 1959) Former mercenary John Corben was transformed into a powerful cyborg with a heart made out of kryptonite. He seeks to use this power source as the instrument of Superman's downfall. Superman #310 (April 1977) Roger Corben, John Corben's brother, had his brain transferred into a similar robotic body as his brother by SKULL. Mongul DC Comics Presents #27 (November 1980) Ruler of the gladiatorial planet Warworld, Mongul's strength rivals that of Superman and he has often attempted to break the Man of Steel. He was slain by the demon Neron. (as Mongul) Superman (vol. 2) #151 (December 1999) Mongul's son who has since taken up the mantle, as has his daughter Mongal. Morgan Edge Superman's Pal Jimmy Olsen #133 (October 1970) A corrupt corporate executive, he tried to take control of Intergang and organized the Post-Crisis iteration of the Superman Revenge Squad. Mister Mxyzptlk Superman #30 (September 1944) An imp from the Fifth Dimension, Mr. Mxyzptlk possesses nigh-limitless reality-bending powers, which he often uses to pose challenges to Superman for his own amusement. The Parasite Action Comics #340 (August 1966) Raymond Maxwell Jensen is a worker at a research plant that stumbles upon waste collected by Superman and is transformed into a purple-skinned monster that lives off the energy of others. Firestorm the Nuclear Man #58 (April 1987) Rudy Jones, a S.T.A.R. Labs janitor, is manipulated by Darkseid into a similar situation that created the original Parasite becoming like him, becoming green-skinned (however his skin eventually became purple, like the original Parasite, due to attempts by doctors to cure his condition). The Phantom Zone criminals Adventure Comics #283 (April 1961) Pre-Crisis, these were Kryptonian criminals exiled to a border continuum called the "Phantom Zone", discovered by Superman's father, in which they only existed in a ghostlike form; this allowed them to survive the destruction of Krypton. Various such criminals would sometimes escape and attack Superman. The Prankster Action Comics #51 (August 1942) Oswald Hubert Loomis, the Prankster, was a criminal; his particular gimmick was the use of various practical jokes and gags in committing his crimes. In the early 2000s, he began using high-tech weaponry. Professor Hamilton Adventures of Superman #424 (January 1987) Emil Hamilton, a mad scientist from S.T.A.R. Labs; he spent years as Superman's ally, but he later turned to evil and joined the Secret Society of Super Villains. The Silver Banshee Action Comics #595 (December 1987) A Gaelic woman trapped in a Limbo for decades by magic after she was double-crossed by a clan chief, then emerged with magic powers and vowed to track down his descendants for revenge. Her scream drains the life out of others. Solomon Grundy Superman #319 (January 1978) Created by the Parasite from slime into which the original Earth-Two Grundy came into contact. Superboy-Prime DC Comics Presents #87 (November 1985) Clark Kent was born on a parallel world that was destroyed during the Crisis on Infinite Earths, Superboy-Prime was trapped outside time for decades. However, his faith in Earth's heroes was destroyed by decades of their mistakes, and he emerged from a pocket dimension to try to replace Superman. Terra-Man Superman #249 (March 1972) A fanatic environmentalist and former businessman with no real superpowers that used advanced technology to give himself abilities. Titano the Super-Ape Superman #127 (February 1959) A colossal ape with kryptonite vision. Post-Crisis, he was a test monkey transformed by a genetic experiment gone awry. The Toyman Action Comics #64 (September 1943) The Toyman (Winslow Percival Schott) uses toy-based or toy-themed devices and gimmicks in his various crimes. The Toyman's weapons, while sometimes comical, are also very dangerous. The Toyman first appeared in animated form on Challenge of the Superfriends, as part of the archvillain supergroup the Legion of Doom, where he donned a jester's outfit. Toyman was a recurring villain in Superman: The Animated Series, where he wore an overgrown fiberglass child's head with a creepy, blank expression on it over his own head. The Toyman also appears in seasons 8 and 9 of Smallville as an overweight technogeek trying to destroy Luthorcorp and the Daily Planet in attempts to kill Oliver Queen, who had fired Winslow from Queen Industries. The Ultra-Humanite Action Comics #13 (July 1939) The Ultra-Humanite is the first supervillain ever faced by Superman and one of the first of the Golden Age of Comics. He was designed to be the polar opposite of the Man of Steel: while Superman is a hero with superhuman strength, Ultra-Humanite is a criminal mastermind who has a crippled body but a highly advanced intellect. Siegel and Shuster retired the Ultra-Humanite as Superman's archfoe when Lex Luthor was introduced into the Superman comic. The Ultra-Humanite was thus retired for several decades only to return with Superman (Earth-Two) and the Justice Society of America the targets of his machinations. The Ultra-Humanite has developed a process of transplanting his mind into different bodies, first doing this with actress Dolores Winters when he was nearly killed, most famously with an albino ape, and also with Johnny Thunder. Ultraman Justice League of America #29 (August 1964) An evil counterpart of Superman from an alternate Earth, Ultraman possesses powers similar to Superman's. Ultraman's power source is through exposure to kryptonite while the Earth's yellow sun weakens him. Ultraman is the leader of the Crime Syndicate of America, a villainous version of the Justice League native to his universe. His power levels are equal to or greater than Superman's as long as his exposure to kryptonite is maintained; if he does not regularly consume it, his strength will decrease. If he is exposed to yellow sunlight for too long, his powers fade away altogether. Aarbur-Z Action Comics #383 (December 1969) Disembodied intelligence inhabiting super-powered costume, pursued by similar entity Enforcer NZ-2, attempted to possess Superman. Acid Master Action Comics #348 (March 1967) Philip Master is a chemist and saboteur who allied with forces behind the Iron Curtain. Aethyr The Phantom Zone #3 (March 1982) A godlike entity from the Phantom Zone that is created from the fusion of millions of souls. Adversary Adventures of Superman #579 (June 2000) Cary Richards is a young child neighbor of Clark and Lois who uses a wheelchair. He made a deal with the demon Lord Satanis to gain psionic powers, subconsciously becoming a stereotypical macho 1990s supervillain (musclebound, wearing leather with metal spikes, spouting profanities, chewing a cigar) named Adversary that wanted to develop a reputation defeating Superman in a similar fashion as Doomsday. Alex Evell Superman #5 (summer 1940) Corrupt politician who forces publisher Zachary Collum to sell the Morning Pictorial to him to help him take over the city. He uses it to lie about his enemies, and when Daily Planet Publisher Burt Mason refuses to stop a story by Clark Kent about his lies and will not sell the paper he declares war against the Planet. His men attack delivery trucks, steal papers and attack those selling them, but Superman helps the Planet and stops the thugs. Knowing Superman is fond of Lois, he calls her to say Clark has been badly injured and is calling for Lois at Bentley Hospital. When she gets to the hospital she is kidnapped, although Superman follows. Bentley sets the place on fire, despite two of his gang members being in there, but Superman escapes, rescues the gangsters and stops Evel's car. Bentley says that he will not talk, but the thugs say that they will to get even with him. Superman leaves them at a police station, Collum gets his paper back and Evell goes to prison. Amalak Superman #190 (October 1966) Alien bounty hunter whose planet was once conquered by Krypton during an imperial phase of its history. Superman #669 (December 2007) His people wiped out by Admiral Zod, Amalak dedicated his life to eradicating all Kryptonian life from existence. Amazing Grace Superman (vol. 2) #3 (March 1987) A servant of Darkseid, she uses her powers of persuasion to maintain his control of Apokolips. Amazo The Brave and the Bold #30 (June 1960) An android with powers similar to those of the Parasite, except that he duplicates their abilities instead of absorbing them. Amok Superman: The 10¢ Adventure (2003) It is known that he was born in Iceland, but how he achieved his metahuman super-strength and energy powers is not yet known. The Amphi-Bandits Action Comics #90 (November 1945) Inventor-turned-criminal Horace Rikker led this gang who evaded police pursuit via a secret submersible vehicle in a Metropolis river. Andrar Superboy #164 (April 1970) Superboy enemy, led Crab Nebulan attempt to invade Earth with android duplicates. The Annihilator and the Annihilator Jr. Action Comics #355-357 Defecting scientist from the Iron Curtain, he utilized Kryptonian explosives, briefly ruled the US. As the madness of his condition faded, his adopted son took a drink of the explosives and gained similar powers. The Anomaly Adventures of Superman #539 (October 1996) Created by Project Cadmus, a clone of a felon. However, he was altered to have the power to mimic the substance of his surroundings. The Archer Superman #13 (December 1941) Quigley, first name unrevealed. Extortionist and archer who targets millionaires, shooting them with a bow and arrow if they do not pay. Superman starts to pursue him and prevents him from shooting Lois and Jimmy. He is revealed to be a hunter who decided to hunt humans instead of animals. The Auctioneer Action Comics #841 (September 2006) A gigantic alien that uses advanced technology to collect valuable items and beings to auction to the highest bidder. Baron Sunday Superman (vol. 2) #26 (December 1988) A villain who uses Voodoo magic against the Man of Steel. Barrage Superman Annual (vol. 2) #2 (1988) Karnowsky is an armored criminal that came into conflict with Superman when he attacked Maggie Sawyer and would go on to join the Superman Revenge Squad. Baud Superman the Man of Steel #71 (September 1997) A female energy being that worked for Mainframe as a spy and fought Superman as part of the Superman Revenge Squad. Big Dome Batman #307 (January 1979) Large-headed purple-skinned being, possible extraterrestrial, planned planetary conquest from Earth base, defeated by Superman with civilian assistance. Blackie Sarto New York World's Fair Comics #2 (1940) A jewel thief who enters the World Fair in an attempt to steal the Madras Emerald, one of the world's biggest jewels which is being delivered from India. Clark Kent recognises him and tells Lois Lane, and when she tells him Pinkerton checks on criminals and will not let them on, Clark says he covered a story four years ago in London where he was a suspect, but released on lack of evidence. With his super-hearing Clark hears him talking about stealing the Madras Emerald to a thug and tells Lois he has a hunch. Lois evades him and follows Sarto, who realises she is following and kidnaps her by seizing her and threatening to shoot her. He takes her to a car where two accomplices are waiting. Clark realises she tried following Sarto and changes into Superman. Meanwhile, Lois is taken to Sarto's riverfront hideaway. Sarto says they will decide how to get rid of her when they get back and Lois is left bound and gagged. Sarto's gang throws deadly gas bombs at the armoured car delivering the Emerald while wearing gas masks, but Superman stops them despite Sarto trying to kill them all with a gas bomb. Superman saves the crooks and takes them unconscious to the police. He then flies to the building and frees Lois, then takes her to the fair and delivers the gem. He then wires the story to the editor as Clark Kent. Blackrock Action Comics #458 (April 1976) A man equipped with an alien rock which gives him energy-manipulation powers. Blaze and Satanus Action Comics #655 (July 1990) Blaze is the half-demon daughter of the wizard Shazam. Adventures of Superman #493 (August 1992) Lord Satanus, the half-demon son of the wizard Shazam, resembled a traditional demon, save that he wore a heavy Roman-style helmet and either had black skin or else the helmet buried his face in shadow. He and Blaze fought for possession of Blaze's domain, using Superman as a pawn. At the end of the story it was revealed that Satanus was disguised as 'Colin Thornton', the publisher of Newstime magazine, who had first appeared in Adventures of Superman #460 (Nov. 1989) and had previously hired Clark Kent as editor. Bloodthirst Superman the Man of Steel #29 (January 1994) Bloodthirst is a very minor villain who is a massive alien creature with multiple holes on his skin that emit a green gas. His weapon appeared to be a circular device like a clock without hands that he could use to slow down or even to stop time. Bloodthirst bragged throughout his first and (to date) only appearance that he was the cause of every major war and was there at every assassination. Bloodthirst was easily defeated by Superman and left Earth. Bloodthirst has not been seen or mentioned since. His storyline is similar to Cereberus who was mentioned in Superman: The Man of Steel #1, then was finally seen in #4 and not seen again after that. Borden Moseley Superman #5 (summer 1940) A financer who is in league with Lex Luthor. Luthor places narcotics around some of the country's most powerful men, taking control of their minds and allowing him to throw the country into depression. Moseley gets business tips from Luthor, although Luthor gets 75% of his profits. Superman finds out about Moseley and gets a list from his safe of those under Luthor's control, despite Moseley trying to lock him in the safe. Moseley tries to ocmmit suicide by leaping from the window, but Superman saves him. He disguises himself as Moseley by contorting his face, a power which he used to use, and infiltrates Luthor's meeting. Luthor realises Superman is there and threatens to shoot those under his control, but Superman stops him and he apparently dies after a plane crash, although he returns later. Those under his control are freed and Moseley is preseumbly arrested, although it is possible he committed suicide after Superman left. Calvin Denby Superman #12 (September–October 1941) After a series of explosions at American defence industries, Superman rounds up members of the Grotak Bund, an organization that has orders to destroy certain American factories to seriously slow down US defence operations. Lois Lane goes to one factory but is seized by a criminal and prevented from speaking. The criminals bind her hand and foot and gag her next to dynamite, hoping her remains will be found and she will be blamed. However Superman stops the bomb in time. Lois goes to see Calvin Denby, who claims to be a patriotic American and is about to give his view on the attacks. Superman realises he is the Leader of the Grotak Bund and when Denby fires at Lois he deflects the bullet, stunning Calvin, who is jailed. Chandu Adventure Comics #219 (December 1955) Superboy enemy, giant gorilla who gained x-ray/heat vision from drinking powdered kryptonite, employed by Doc Baird and his gang for crimes. Colonel Future Action Comics #484 (June 1978) Edmund H. Future uses his gang to steal the most advanced technology and employ its use in his crimes. Superman #378 (December 1982) Edmund Hamilton is a NASA scientist who, through a freak accident, developed the ability to glimpse into the future by surviving near-death experiences. He uses this knowledge to develop an arsenal to steal components to prevent an event that would destroy the Earth. He reappears in a later story trying to save Superman from an assassination attempt, only to find out that he himself (in a Superman costume) would be the victim, and is saved by Superman performing CPR. The character and his alter ego are a hommage to science fiction author Edmond Hamilton and his most famous work, Captain Future. Count X Action Comics #301 (June 1963) Master spy. The Crime Professor Superboy #30 (January 1954) Superboy enemy, Mr. Oates, criminal strategist. Dabney Donovan Superman's Pal Jimmy Olsen #142 (October 1971) A "mad scientist" and expert at genetic manipulation and cloning, former employee of Project Cadmus. Deathtrap/The Master Jailer Superman #331 (January 1979) Carl Draper, a master trapmaker, was hired to build a trap to contain the Parasite. However, when his daughter challenged him to trap Superman, he wholeheartedly accepted it. He would appear to Superman as a hologram and challenge him to escape the traps he created. Post-Crisis, his powers and skills were enhanced and he was part of an Anti-Kryptonian Brigade with Bizarro, Mongul and the Silver Banshee. He eventually (somewhat) reformed and was employed by Checkmate. Dev-Em Adventure Comics #287 (June 1961) A surviving Kryptonian juvenile delinquent, he kidnapped Superboy and took his place. Years later he time-traveled to the future and became a law-enforcement agent. Doctor Chaos New Adventures of Superboy #25 (January 1982) Superboy enemy, Burt Belker, Professor Lewis Lang's assistant, empowered and possessed by a Lord of Chaos via the Chaos Helmet from the Valley of Ur. Dominus Action Comics #747 (August 1998) An alien priest that sought the powers of Kismet and brainwashed Superman into conquering Earth. Duke Duvvil Adventure Comics #199 (April 1954) Superboy enemy, traitorous nobleman in subterranean kingdom of Subbania, sought to overthrow Queen Lya. Duran Superman Annual (vol. 2) #12 (August 2000) Created as part of the Planet DC Annuals event, Duran is a Mexican wizard who is a member of the fictional "Oto tribe". Disturbed by the practices of capitalist, anti-environment developers, Duran becomes their sworn enemy and embarks on a career of eco-terrorism. He devises a plan to summon and set loose an army of monsters against the Mexican people to punish them for the pollution they produce. Duran abducts a young girl and takes her to his base under the Plaza de la Constitución in Mexico City, with the intention of using her as the focus of a magical ritual to summon the power of the Aztec god Ometeotl. His plans were foiled by Superman with the assistance of the Mexican heroes Iman, Acrata and El Muerto. Dyna-Mind New Adventures of Superboy #42 (June 1983) Superboy enemy, Johnny Webber, granted telekinetic powers by meteor, able to create and animate giant figures. Eclipso House of Secrets #61 (August 1963) The immortal incarnation of the Wrath of God and the Angel of Vengeance who is able to possess people and has a huge variety of magical powers. Effron the Sorcerer World's Finest Comics #210 (March 1972) A sorcerer who came from the magic kingdom of Veliathan and controlled a faceless puppet army. The Emperor of America Action Comics #52 (September 1942) Power-mad individual who creates a device which emits rays that take away the will of people to resist. He blankets the nation in the rays, then with just a few henchmen, wearing helmets that make them resistant to the ray, he marches into the White House and declares himself Emperor of America. He takes vast amounts of wealth and even replaces the Supreme Court with his henchmen. Only Superman remains immune and he is finally able to stop the Emperor's plan. The character should not be confused with the Atom (Al Pratt)'s enemy of the same name from All-American Comics #21 (December 1940). La Encantadora Secret Origins of Super-Villains 80-Page Giant (December 1999) Gaining magic powers from the mystical Mists of Ibella, Lourdes Lucero first encountered Superman while hypnotizing him to react adversely to fake kryptonite. The Evolution King Superman #15 (March-April 1942) An evil scientist who has "learned how to advance or revert a human being’s age" by means of special pills. Aided by gangster Joe Glower and his henchmen, the Evolution King kidnaps prominent athletes, transforms them into helpless old men, and threatens to leave them in their decrepit condition unless they meet his extortion demands. He then starts turning people into infants. Clark realises an old man is a missing athlete due to his fingerprints. Lois Lane is with one of the athletes so is kidnapped with him, blindfolded, and driven to the base. Clark is also captured. Both he and Lois are soon tied to chairs and in the presence of the Evolution King. Goaded finally by Clark Kent into demonstrating the effects of his old-age pills by swallowing one himself, the Evolution King ages, causing Lois to faint. Clark then breaks his bonds and forces the Evolution King to reveal how people can be turned back. The Evolution King perishes when, moments later, he accidentally swallows some additional aging pills instead of the intended antidote. Faustus Coven Superboy #175 (June 1971) Superboy enemy, patriarch of Coven family, used combination of sorcery and science to separate Superboy's soul from his body and enslave it. Ferlin Nyxly Superman #235 (March 1971) Former curator of the Metropolis Music Museum who, on some occasions, has attacked Superman with the help of magical objects or alien technology he found or stole. The Futuremen Superman #128 (April 1959) Two criminals, Vard and Boka, from the year 2000 travel back in time, and claim to an incredibly gullible FBI Chief that Superman is a criminal from their time. They capture him using red kryptonite, and reveal an atomic experiment has dried up Earth's water supply and they want Superman to restore it with ice from Saturn, hoping to get billions from Earth. Superman escapes them, has them jailed by the authorities of the year 2000 and then returns to 1952. Gaff Lomar Superboy #27 (August–September 1953) Superboy enemy, "pied piper" who mesmerized Smallville's children into following him. The Galactic Golem Superman #248 (February 1972) An artificial construct created by Lex Luthor that was sometimes used by him to fight Superman. The Gambler Superboy #140 (July 1967) Superboy enemy, "Lucky" Lucifer Chancel, gangster and obsessive gambler, engineered crises for Superboy to face, then accepted bets on the results. The Gem Superboy #19 (April–May 1952) Superboy enemy, a.k.a. the Crystalloid, crystalline life-form that consumes all in its path. Glowman (as Bashford) Superboy #157 (June 1969); (as Glowman) New Adventures of Superboy #30 (June 1982) Superboy enemy, Bradley "Bash" Bashford, Smallville High bully transformed into a monstrous fiery form. Goldie Gates Superman #27 (March–April 1944) The notorious Goldie Gates convinces Randall Rocksell that if he will invest huge sums of money with him, Rocksell will make a half-million a day on his investment. However, Superman discovers that Rocksell is being paid dividends with his own money and Gates is perilously close to gaining the power of attorney over Rocksell's money and property. When Randall fully believes that Gates will make him money, he gives him access to his vault, after which Goldie takes the money. Superman sees the crooks and recognises one as Bucktooth Burger, one of Goldie Gates' mob. Later Gates' crooks get into Randall's house, where he and Lois are talking. Bucktooth points a gun at Lois and Goldie says she will be shot unless Randall signs a document giving him control over his property. Despite Lois telling him not to, Randall signs. Bucktooth then crams a cloth into Lois's mouth to gag her and Randall is knocked out. He comes to in an underground room with Lois next to him. Both of them are tied to a log. Goldie plans for them both to be killed by dynamite. However, Superman gets to the room and stops the dynamite. Meanwhile, the crooks think that they will be unable to get out of the tunnel in time. They are relieved to see Superman, who then takes them of to jail. Randall, meanwhile, becomes a better person. Grax Action Comics #342 (October 1966) Brainiac's blue-skinned, four-armed rival featuring a 20th-level intellect (as opposed to Brainiac's 12th-level intellect) whose plots are also foiled by Superman and who seeks vengeance. He also appeared in the Super Friends comic book. Harkon Superboy #194 (April 1973) Superboy enemy, renegade Atlantean/merman scientist, temporarily transformed Superboy into a merboy. The Hellgrammite The Brave and the Bold #80 (October–November 1968) Roderick Rose transforms himself into a large insectoid and has battled Superman several times since. The Host Superman #6 (June 1987) A construct containing the souls of a long-lost prehuman race. Illena Superman's Girl Friend, Lois Lane #52 (October 1964) Alien woman, romanced Superman with intent to turn him into stone. Ignition Adventures of Superman #582 (September 2000) Created by the Joker after he stole the powers of Mr. Mxyzptlk. (Post-Crisis) Superman #671 (February 2008) Pre-Crisis, Earth-One Lana Lang saves an alien that gives her a ring that offered her the powers of any insect or arachnid and becomes a superhero. Post-Crisis, Earth-Two Lana Lang receives a magical scarab from her archaeological father that possesses her and offers the power to enlarge and control insects, becoming a supervillain. Also Post-Crisis, the Insect Queen is an alien that assists Lex Luthor in return for his assistance into colonizing Earth. She uses Lana Lang's DNA to make a new body mixed with her own genetic material. She would later return, possessing Lana's body. J. Wilbur Wolfingham Superman #26 (January-February 1944) A notorious confidence man whose elaborate schemes are interfered with by Superman to profit his victim while he is left with nothing. On one occasion he placed oil in a well to con the Eden Farming Community, an area recently hit by a tornado. He then bought the land and claimed that there was an oil well on it, after which the locals paid in cash for shares in it. Lois and Clark told them who Wilbur really was and they started searching the area for him. Lois found him in a barn and told him to give himself up, but he seized her, covering her mouth to prevent her speaking. He then bound and gagged her and lowered her into the well. He said she would probably be found before she starved, but by then he would be gone. He then hid in a haystack, but a match dropped by him set the oil alight. The flames then started burning through the rope holding Lois up. Clark saw where she was with his X-ray vision, changed into Superman and saved her just as the rope snapped. He then burrowed underground to escape the explosion from the layer of oil, freed Lois, then found a genuine oil well which he diverted to the town. After this he captures Wilbur, who was stuck in the burning haystack, and makes him return the money to the people, who will now become rich due to the oil. J.E. Curtis Superman #4 (spring 1940) An agent paid by a foreign power to stop the Nation's return to prosperity, which is happening after the depression. His men cause incidents in industry to cause strikes. Superman investigates and stops the attacks. He gets to the boss, who tries to poison him, then when Superman is not killed, he tells Superman about Curtis. Curtis is about to make a call to agents in the stock market to cause the worst depression in American history, but Superman enters with the other crook. Curtis kills the man with a device that fires electrical bolts and tries to kill Superman after Superman refuses his offer to join him. But Superman is unharmed and touches Curtis, electrocuting and killing him. Kalibak New Gods #1 (February 1971) The son of Darkseid, a born villain. Kancer Action Comics #777 (May 2001) Created from a sliver of kryptonite-induced cancer at the behest of the Russian Zod. Khyber Superman #657 (December 2006) Hassan-I-Sabbah, leader of the Hashshashin assassins, is a shadowy figure behind world politics, steering humanity to fall under his rule in the future. Arion reveals to Superman that his presence on Earth has weakened humanity against future threats and in the future, after Superman falls to the cybernetically enhanced Khyber, humanity will die out because of this weakness. King Kosmos DC Comics Presents Annual #2 (1983) A time-traveling despot from the future who comes to the present in order to conquer it. His efforts are halted by Superman and the mysterious Superwoman, who also makes her premiere appearance and is, in reality, time traveler Kristin Wells. Klaxxu Superman Family #197 (September–October 1979) Superboy enemy, extraterrestrial exiled to Earth for attempting to overthrow his planet's government, posed as teacher at Smallville High, used mild-melder device in attempt to convince Superboy he was Klaxxu's fellow subversive. Kokra New Adventures of Superboy #2 (February 1980) Superboy enemy, Middle Eastern demon who possessed Prof. Lewis Lang (Lana's father). Kosmon the Hunter Adventure Comics #266 (November 1959) Superboy enemy, alien hunter, captured Krypto and used shapechanging protoplasm creature to lure Superboy into battle. Kronn Adventure Comics #308 (May 1963) Superboy enemy, criminal Atlantean scientist, allied with Luthor to transmit mass hypnotic illusions to Smallville. Kru-El Superman's Pal Jimmy Olsen #62 (July 1962) In most settings, Superman's villainous cousin. The Kryptonoid Superman #328 (October 1978) A protoplasmic entity that sought revenge against Jor-El by seeking out his son and merging with a Superman Robot and General D.W. Derwent (who blamed Superman for the loss of his arm). Kuku and Nardu Superboy #167 (July 1970) Superboy enemies, circus performers and criminals, used robot elephant to commit crimes. Kyack Superman #13 (November–December 1941) Warrior of subterranean kingdom descended from a pre-Ice Age civilization, sought to conquer surface world, destroyed buildings in prelude to invasion. Lady Lunar World's Finest Comics #266 (January 1981) Stacy Macklin was exposed to the same radiation as the Moonman to become Lady Lunar and troubled Metropolis. It would take the efforts of Superman and Batman to stop her. Lashina Mister Miracle #6 (January 1972) A member of Darkseid's Female Furies. The Laughing Gas Bandits Adventure Comics #484 (August 1981) Three men, used nitrous oxide laced with kryptonite in effort to immobilize Metropolis. The Leader Adventure Comics #277 (October 1960) Superboy enemy, with two fellow aliens, fought duel with Superboy, with potential invasion of Earth as the stakes. Lelia Superman #13 (December 1941) An agent of a foreign power. Scientist Charle Pierson invents a weapon, but is captured by agents of a foreign power, tortured and killed. His wife Clara leaves their baby with Clark Kent so the agents will not capture him and get the plans from her, along with a note saying she will get the baby soon. Superman stops the first kidnap attempt, but Lelia then appears claiming to be the mother and takes the baby. The mother turns up soon after and tells Clark what has happened. She gets a phone call telling her to come to a location, which Superman follows her to. She is held prisoner by the villains and tells them the plans are hidden inside the baby's rattle, which is still in the flat. When the agents leave, Superman leaps in, overpowers Lelia, and after binding and gagging her, waits for the agents. The agents return to the apartment and seize Lois Lane, preventing her from speaking. However, they are captured and the plans are given to the government. Lelia and the other agents are probably jailed. The Leopard Superman #20 (January–February 1943) Sam Kennedy, publicity manager for Cosmo's Circus, wore a leopard head mask during a crime spree in which he and his gang used packs of big cats to commit crimes. The Lightning Master Superman #14 (January–February 1942) A villain who learns how to control lightning and tries to ransom Metropolis for $300,000. He captures Lois Lane twice, first when she goes to hear his ransom demand. She tries to unmask him, but is captured by him and bound hand and foot to a chair. He tries to send electrical bolts at the house to kill her, but Superman rescues her. The second time he straps her into an electric chair as he prepares to attack Metropolis for not paying the ransom. However Superman stops this and in the fight the Lightning Master is electrocuted and killed. Loophole Adventures of Superman #505 (October 1993) Deke Dickson, a former S.T.A.R. Labs employee, uses technology to open up portals that act as a tunnel through matter. Lorac-K7 Adventure Comics #250 (July 1958) Superboy enemy, criminal descendant of Lana Lang, traveled back in time from 2958 to steal cobalt for a cobalt bomb, impersonating Lana while doing so. Lord Satanis and Syrene Action Comics #527 (January 1982) Living in a time millions of years from now where magic has taken the place of science, Lord Satanis led a revolt of sorcerers against the powerful Queen Ambra and killed her. However, he was denied the right to possess her runestone of Merlin when she cast it into the past, out of his reach. Satanis would marry Ambra's daughter Syrene (whom she had with Merlin), who also sought possession of the runestone. Both of them would eventually find the spells necessary to follow the runestone through time and face Superman, who was needed as a component to use it. The couple would attempt to get the runestone several times before finally returning to their own time period. Lyla Action Comics #812 (April 2004) A telepath that pulled Superman into Kandor and stole his powers to escape in hopes of making the people of Earth worship her as a god. Maaldor the Darklord DC Comics Presents #56 (April 1983) An other-dimensional being of incalculable power that wanted to test his strength against Superman and Power Girl. When it became clear Maaldor was too powerful, Superman tricked him into destroying himself, but he instead became a cosmic intelligence. Maaldor would return repeatedly, often seemingly resurrecting from destruction, to face Superman two more times (the second time with Madame Xanadu and the third time with both the Phantom Stranger and the Joker) and then the Green Lantern Corps. He finally perished for good in Crisis on Infinite Earths #10 (January 1986) and has not been seen since. The Magpie The Man of Steel #3 (November 1986) A female master jewel thief who targets gems named after birds and replaces them with booby-trapped replicas. (as the Malleable Man) DC Comics Presents #93 (May 1986) A criminal present when Plastic Man gained his powers, "Skizzle" Shanks later recreated the process to make himself malleable. He manipulated Plastic Man, the Elongated Man and Elastic Lad to battle Superman. Manchester Black Action Comics #775 (March 2001) A British telepath and antihero, he dislikes what he perceives as Superman's simplistic view of the world and becomes obsessed with twisting and destroying Superman's morality. He later learns Superman's true identity and manipulates a large group of supervillains to attack Superman and his known family/friends/associates. When even this manipulation, climaxed with tricking Superman into thinking he has killed Lois Lane, fails to break Superman's spirit, he retreats completely and ends his life over the anguish of his failure. The Mask World's Finest Comics #66 (September–October 1953) Harry "King" Saphire, crime czar who wore a lead mask as part of an elaborate scheme to frame Superman for his crimes. The Masked Stuntman Adventure Comics #165 (June 1951) Superboy enemy, Flip Wilson, acrobatic criminal using stuntman school as a front. Massacre Adventures of Superman #509 (February 1994) An alien warrior who traveled space as energy seeking a worthy opponent; he died during the Our Worlds at War crossover. The Mechanical Master Superman Family #193 (January–February 1979) Superboy enemy, able to animate machines to do his bidding. Medini Action Comics #25 (June 1940) A great Asian hypnotist who performs crimes, using his hypnotism to make people forget them. When he meets Superman, the Man of Steel is weakened by his hypnotic power and is unable to control his powers properly, while Medini leaves with a captive hypnotized Lois Lane, planning to rob a gold shipment to Kentucky from a plane. Superman leaps through the stratosphere, then suddenly down again, the swift descent and sudden atmospheric change restoring his mind to normal. He then stops the plane Medini has robbed from crashing and tells the police where the loot is hidden. It is unknown what happened to Medini, as he is not mentioned to have been arrested or escaped, although Superman is shown throwing the emptied plane onto some of his henchmen, so possibly Medini was also killed. The Microwave Man Action Comics #487 (September 1978) Lewis Padgett was a supervillain named the Microwave Man in the 1930s that traveled with aliens through space for 40 years, returning to Earth as an old man. Padgett convinced the aliens to return his youth, although it meant he only had hours to live. His final wish was to defeat Superman, which the hero granted so that Padgett could die happy. Mighto Superboy #108 (October 1963) Superboy enemy, a.k.a. Tim Tates, superpowered alien youth briefly adopted by Kents prior to their adoption of Kal-El, became spacefaring criminal, returned years later to battle Superboy. Mind's-Eye New Adventures of Superboy (December 1982) Superboy enemy, seized mental control of Smallville High student body and channeled their energies to empower himself to fight Superboy. Mister Cipher(s) Superboy #150 (September 1968) Superboy enemies, lookalike robots, equipped with explosives, attempted to take over Smallville on behalf of the alien Cybor. Mister Electronics Superboy #73 (June 1959) Superboy enemy, criminal scientist, employed mind-reading device. Mister Migraine More Fun Comics #106 (November–December 1945) Superboy enemy, racketeer. Mister Ohm Superman #51 (March–April 1948) Used electromagnetic plane to draw armored cars into air and take them to his gang's hideout to loot at leisure. Mister Sinister Superman #16 (May–June 1942) Real name Lylo. Purple-skinned denizen of the Fourth Dimension, would-be conqueror and failed poet, used advanced technology to abduct buildings with inhabitants to hold for ransom. Mister Z Superman (vol. 2) #51 (January 1991) A mysterious immortal who seeks to trap famous people from history in a mystical crystal. He attempts to entrap Superman, but the Man of Steel manages to destroy the crystal. Momentus Superman #355 (January 1981) Asa Ezaak was a noted author (based on legendary science-fiction writer Isaac Asimov) who could transform into a water-like being capable of controlling gravity after injecting himself with his created potion "Ezaakis." Kidnapping Ezaak-fan Jimmy Olsen because he erroneously thought he was being investigated by the reporter, Momentus died in battle with Superman. (as Mongal) Superman (vol. 2) #170 (July 2001) The daughter of the interstellar tyrant Mongul. The Moon-Man/the Moonman World's Finest Comics #98 (December 1958) Superman assists the military by launching astronaut Brice Rogers to travel around the moon. When Rogers returns to Earth, under the rays of the Moon, he transforms into the supervillain called the Moonman and menaces Superman, Batman and Robin. The Mummer Adventure Comics #148 (January 1950) Superboy enemy, costumed criminal, ex-vaudevillian, committed crimes with three "robot dummies". Nam-Ek Superman #282 (December 1974) A Kryptonian that murdered a hideous, foul-smelling sacred beast called a rondor whose glowing horn emitted a healing ray (this outlawed their being killed) to develop an elixir for immortality. While it worked, Nam-Ek was transformed into a hideous, foul-smelling, purple-skinned rondor-like monster with a glowing horn protruding from his forehead and was sentenced to the Phantom Zone for his crime. He would escape and battle Superman. The Negative Superboy Superboy #168 (September 1970) Superboy enemy, negative-energy duplicate of Superboy created in a cosmic accident. Neutron Action Comics #525 (November 1981) Nathaniel Tryon was a petty thug and a member of the TNT Trio before an accident transformed him into living nuclear energy. The Njllnans New Adventures of Superboy #40 (April 1983) Superboy enemies, N’ll, Vrt and others attempted to make Superboy into a "living robot" as their pawn in conquering Earth. N.R.G.-X (Pre-Crisis) Superman #339 (September 1979); (Post-Crisis) Superman/Batman #68 (March 2010) Pre-Crisis: Grant Haskill was transformed into a living robot by an explosion. At one point, he accidentally turned the Man of Steel into actual steel. Post-Crisis: Miguel Diaz and Ray Ryker were two physicists until a nuclear experiment goes wrong. Diaz is caught in an explosion that transfers his essence into the mechanical being, N.R.G.-X (Nuclear Radiation Generator - Experimental). Confused and trying to escape, he confronts Superman encasing him in a steel shell. N.R.G.-X attempts to go after Ryker. Breaking free, Superman once again confronts N.R.G.-X, who self-destructs in the process, reverting to a comatose Daiz. Nylor Truggs New Adventures of Superboy #50 (February 1984) Superboy enemy, 30th century criminal, stole the Dial H for Hero dial from a museum and traveled back in time to ally with teen Lex Luthor; used dial-created super-identities Cyclone, Landslide, Smasher and High-Roller. Nzykmulk Superman #421 (July 1986) Mr. Mxyzptlk's deranged cousin from the fifth dimension with magical powers surpassing even Mr. Mxyzptlk's own. Although to human eyes he looks identical to Mxyzptlk, according to Mxyzptlk nothing could be further from the truth. Escaping from the fifth dimension's mental institution equivalent of a madhouse (gooloogog), Nzykmulk's greater fifth dimension powers stems from several more years of experience in comparison to his cousin, 42 joljos (years?) difference with his greater age. Appeared only once during the last Pre-Crisis era days to cause Superman and Mxyzptlk problems while trapping them both within the fifth dimension itself. Obsession Adventures of Superman #532 (February 1996) A disturbed fan of Superman, Dana Dearden stole magical objects to gain powers to be Superman's partner and lover, beating Jimmy Olsen until he gave her his signal watch. Dubbing herself Superwoman, Olsen instead called her Obsession and she would eventually give her life to save Superman. The Orbitrons Batman #312 (June 1979) Floating globe-like aliens residing "somewhere in the outermost galaxy", used magnetic rays to plunder gold and abduct Earth scientists until dissuaded by Superman. Othar Superboy #101 (December 1962) Superboy enemy, abducted Superboy and other super-heroes to the planet Thrann. Pee Wee Ragan Superboy #110 (January 1964) Superboy enemy, scrawny criminal, received duplicate Superboy powers from Professor Sardon. The Planeteer Superman #387 (September 1983) a.k.a. King Alexander. Alexander Mason was a child prodigy who became the world's leading magnetism expert at a very young age; however, he was also a megalomaniac who believed that he was the reincarnation of Alexander the Great and that it was his destiny to conquer the world. As the Planeteer, he used advanced magnetic field technology to abduct world leaders. When Superman rescued them, he destroyed the magnetic machines, unaware that by doing so, he was channeling their power directly into the Planeteer, who thus gained superhuman magnetic abilities. He later teamed up with Zazzala the Queen Bee. Povra New Adventures of Superboy #20 (August 1981) Superboy enemy, beautiful woman from planet Ulmara, abducted Superboy and brainwashed him to be a tourist attraction on Ulmara. The Predators Superman vs. Predator, DC Comics crossover miniseries (May–July 2000) A space hunter from the 1987 horror film Predator directed by John McTiernan. The Predators are depicted as large, sapient and sentient humanoid creatures who possess advanced technology, such as active camouflage and energy weapons, and are capable of interstellar travel. Preus Superman (vol. 2) #202 (April 2004) Formerly a law enforcement officer from the bottle city of Kandor, he escaped the city and hunts Superman. Professor Amos Weldon Superboy #53 (December 1956) Superboy enemy, criminal scientist, his time-ray inadvertently caused Superboy to change places in time with Superman. Professor Sands Action Comics #178 (March 1953) a.k.a. the Sandman of Crime; proprietor of the Dreamorama, a theater which, via what might today be considered virtual reality technology, allowed demoralized criminals to live out their greatest criminal fantasies in "dream films". Professor X Superboy #69 (December 1958) Superboy enemies, two criminals using a single identity as a mob boss. Professor Zee Superman #8 (January–February 1941) An evil scientist who creates a formula that turns people into giants. He causes chaos around the country, kidnapping a powerful figure and threatening to turn his daughter into a giant. However, he is killed in an accident caused by the giants. He is not to be confused with the Professor Zee who created the time machine used by Per Degaton. Psi-Phon and the Dreadnaught Superman (vol. 2) #19 (July 1988) Psi-Phon drained Superman's powers and gave them to the Dreadnaught. Pulsar New Adventures of Superboy #31 (July 1982) Superboy enemy, Robert Altus Jr., empowered by obsessed scientist father to supplant Superboy. The Puzzler Action Comics #49 (June 1942) A criminal obsessed with games and puzzles, he fought Superman after he tried to start a protection racket. Superman #187 (December 2002) Valerie Van Haften is made up of living puzzle pieces, able to move and reconstruct herself at will. The Quarmer a.k.a. the Sand Superman Superman # 233 (January 1971) Originally a non-corporeal being from a realm called the Quarrm Dimension, it entered our dimension where it built itself a body of sand and, over time, drained Superman's powers, gradually turning into a sandmade doppelganger of Superman. Quex-Ul Superman #157 (November 1962) A Kryptonian criminal and inmate of the Phantom Zone. Usually a henchman of General Zod. R24 Superman #71 (July–August 1951) Leader of a uranium-smuggling ring. The Rainbow Raider Superboy #84 (October 1960) Superboy enemy; the Rainbow Raider identity was originally used by Jonathan Kent to impersonate a supervillain as part of an elaborate scheme for Superboy to capture gangster Vic Munster and his henchmen; later, Munster himself used the Rainbow Raider identity, but was again defeated. The Rainmaker World's Best Comics #1 (spring 1941) Used rain machine to destroy dam and flood valley as part of extortion scheme, briefly weakened Superman with a "radical new paralysis gas." Ralph Cowan Action Comics #41 (October 1941) A respectable figure who has been paid to case sabotage around the nation. One of his agents, Steve Grant, places a bomb inside a plant. He is one of three employees who took the day off and is tracked down by Superman. Cowan tries to kill him to stop him from talking, but Superman foils the attempts. He hears of a wave of sabotage across the nation. Cowan, angry at the Daily Planet writing down stories of the sabotage, gets into the Planet, and when Lois meets him he claims to be an electrician. She sees him planting a bomb, so he ties her up and gags her. He leaves, hoping she will be killed in the bomb blast. However Superman rescues her in time and stops the bomb from destroying the Planet. He then captures Cowan. Razkal Superman #15 (March-April 1942) The dictator of Oxnalia who is based on Adolf Hitler and attacks the democratic nation of Numark. Superman stops an assassination attempt on Numark's King Boris, then saves Numark's young Prince Micheal after he is kidnapped and taken to the castle of the treacherous Lord Murgot, who is killed. Superman then stops an attacking army as well as bringing about peace between the two nations. Razkal tries to escape, but is shot and killed by one of hs own men. Rebello Superboy #72 (April 1959) Superboy enemy, renegade Superboy robot, considered itself more "perfect" than Superboy and sought to supplant him. Redemption Action Comics #848 (May 2007) Jarod Dale is able to draw power from his congregation's faith and prayer to become an immensely powerful superhuman. However, Pastor Matthews Hightower was the catalyst behind the power and subverted Redemption into killing soldiers in Africa. Remnant Superman: Day of Doom miniseries (2003) A villain whose identity is still a mystery. He holds Superman responsible for the tragedies that resulted from his first battle with Doomsday. Even though he looks like a supernatural wraith, Superman deduced the villain is an ordinary human with such advanced illusionary technology that even the Man of Steel had difficulty determining whether it was real or illusions, despite his enhanced senses of sight and hearing. The Ringmaster Adventure Comics #120 (September 1947) Superboy enemy, led a "Crime Circus" including Grillo, Musculo, Loop and Swoop. Riot Superman the Man of Steel #61 (October 1996) Scientist Frederick Legion worked with machinery and discovered a way to duplicate himself at the cost of his ability to sleep. Driven mad by insomnia, he began a criminal career. The Rock Superman the Man of Tomorrow #8 (spring 1997) An astronaut who, after an experiment, becomes a rock-like behemoth, blaming Lex Luthor for the development and coming into conflict with Superman while trying to enact revenge. Ron-Avon Superboy #141 (September 1967) Superboy enemy, superhuman youth from the planet Belgor, forced to fight Superboy in gladiatorial combat. The Savior Action Comics #705 (December 1994) Ramsey Murdoch believes that Superman is a fake and that the real Superman never recovered from his death at the hands of Doomsday. He has the ability to create or become anything he imagines. The Seal Gang Action Comics #231 (August 1957) Modern-day pirates whose use of a subterranean base on the supposedly deserted island Vumania was inadvertently exposed by Jimmy Olsen when he inherited the island. The Seeker Superman Family #191 (September–October 1978) Superboy enemy, sentient Kryptonian spacecraft, sent prior to Krypton's destruction to locate suitable planet for relocation, attempted to terraform Earth to fit specifications. Shadowdragon Superman #97 (February 1995) A quasi-techno ninja, Savitar Bandu is the prince of Bhutan who worked briefly for Conduit before learning what kind of person he was and turning on him. Shockwave Blue Devil #2 (July 1984) A short armored criminal. Simyan and Mokkari Superman's Pal Jimmy Olsen #135 (January 1971) Products of the twisted genius of Dabney Donovan, they ran from him and became servants of Darkseid. SKULL Superman #301 (July 1976) Criminal organization of geniuses and scientists formed by the original Atomic Skull that often comes into conflict with Kobra. Skyhook Superman (vol. 2) #15 (March 1988) A Fagin-like corrupter of children who was turned into a winged demon by Blaze. His egg-like cocoons can mutate children into winged beings under his control. Sleez Action Comics #592 (September 1987) An evil schemer from Apokolips. Slug Kelly Superman #5 (summer 1940) A criminal who places rigged slot machines in stores to make schoolchildren lose their money, threatening some store owners. When Lois and Clark enter his hideout and will not be bribed, he threatens to kill Clark unless Lois signs a paper saying her editor George Taylor is Slug's partner in the slot-machine racket, meaning nothing he printed against him would be believed. He then has it taken to the Morning Pictorial. Clark becomes Superman and wrecks the building, which is set alight, but Superman escapes with the unconscious Lois and the ledger books. Taylor is angry at the false story, but Superman uses his photographic memory to remember the addresses from Slug's secret records, after which he starts clearing Metropolis of the slot machines. Slug kidnaps Lois, but Superman captures Slug and dangles him over a school building until he tells the children about the slot machines. Although the men confess, the police say they cannot hold them without witnesses, but hundreds of schoolchildren then pour into the station as witnesses. The connection between Taylor and Slug is disapproved during the trial. This story was a message to children not to use slot machines. Socrates Adventure Comics #225 (June 1956) Superboy enemy, mynah bird who acquired superpowers and criminal human-level intelligence from drinking kryptonite-tainted water. Sodom and Gomorrah Action Comics #819 (November 2004) A husband-and-wife team that have the ability to fire blasts when touching each other's hand. The blast on impact turns whatever it hits into salt. Solar Boy Adventure Comics #269 (February 1960) Superboy enemy, superpowered alien youth who captured and sadistically mistreated Krypto the Superdog until Superboy rescued him. Space-Boy Adventure Comics #264 (September 1959) Superboy enemy, Zall-Dix, alien youth who attempted to force Superboy to exchange bodies with him. Srakka Superman #398 (January 1984) An alien dybbuk who can possess the bodies of others. Stasis Superman Family #192 (November–December 1978) Superboy enemy, able to halt biological functions in victims' bodies, led gang in attempted takeover of Smallville. Subjekt-17 Superman #655 (October 2006) An alien family crashes in Kazakhstan, the father dead and the pregnant mother taken by Russian scientists for testing. However, the alien female would die during this time and all that was left was the alien infant. Dubbed Subjekt-17, the infant would spend largely his entire life imprisoned. Upon his escape, unable to blend into human culture because of his appearance and angry at his treatment by the Russian scientists, he seeks revenge against the humans of Earth, the similarly alien Superman becoming the focus of his ire. The Strongarm Bandit Action Comics #27 (August 1940) A masked criminal with enormous strength who starts committing crimes around the city after a circus comes to town. Herculo the circus strongman is suspected and Superman competes with him, easily defeating him. Clark is earlier robbed at the circus after buying multiple tickets for orphans, but has sprinkled a red powder on the money, meaning the criminal is caught 'red-handed', is revealed to be a clown who was the former strongman, and who is arrested. Superwoman Justice League of America #29 (August 1964) A villainous version of Wonder Woman from a reversed version of Earth. The Talon Superman #17 (July–August 1942) Albert Caldwell, president of Metropolis Subway Inc. and Axis fifth columnist who attempted to sabotage Metropolis's transportation system. Tara Cobol Mystery in Space #114 (December 1980) With assistant Fortran, used S.T.A.R. computer to seize control of weather satellites. Thaddeus Killgrave Superman #19 (July 1988) Mad scientist. The Thing from 40,000 A.D. Superman #87 (February 1954) Shape-changing mass of "primeval matter" banished from the year A.D. 40,000, impersonated Superman and others during an attempt to return to its home era and conquer it. The Thought Explorers Adventure Comics #456 (March–April 1978) Superboy enemies, two alien researchers, used illusory attacks on Smallville to test Superboy. Tolos Superman (vol. 2) #107 (December 1995) An alien wizard that added alien beings to the bottle city of Kandor with the ability to possess the bodies of its inhabitants. Turlock the Berserker New Adventures of Superboy #49 (January 1984) Superboy enemy, extradimensional barbarian warrior, wielded burning sword, rode in chariot drawn by two two-headed dog/rat creatures. The Tweeds Action Comics #26 (July 1940) Clark arrives for a date with Lois, who is making a donation to the Brentwood Rehabilitation Home. Clark tells her that the place is more interested in money than their young charges. Lois decides they should visit the home so that she can disprove Clark. After a pleasant visit, Lois and Clark are stopped by a charge, Davey Merrill, who cut his hands climbing the wall just to ask for something to eat. Once they feed him, he tells them all about the horrible conditions at the home. They return, but the barking of the guard dog Black Satan wakes up Mrs. Tweed. Superman saves them from the dog, but when Davey enters the Tweeds find him and seeing his cut hands they realise he has been over the fence and lock him in a cupboard downstairs. Lois goes back to investigate and finds records which prove the Tweeds are not spending the money on the children, but she is seized by the Tweeds. They tie her up, gag her and leave her in a barred cell. Lois then hears a noise from Davey. She rubs her face against the iron bars of her cell and removes her gag, then talks to Davey. Assuming Lois has gotten into trouble, Superman rushes to the home to save her and Davey. He saves them both and the Tweeds are arrested. The Untouchables DC Comics Presents #58 (June 1983) Originally called the Intangibles, a trio of criminals that use technology that make themselves intangible who fought Superman, Robin and Elongated Man. They would return modelling themselves after John Dillinger, Bonnie Parker and Clyde Barrow and battle Hawk and Dove. Vakox Superboy #104 (April 1963) A Phantom Zone prisoner. Varx Superboy #192 (December 1972) Superboy enemy, sole survivor of subterranean Atlantean civilization, attempted to screen Smallville from the sun, which he superstitiously feared. Vyndktvx Action Comics #1 (September 2011) An impish supervillain that is an enemy of Superman and Superman's enemy Mr. Mxyzptlk. The Wraith New Adventures of Superboy #21 (September 1981) Superboy enemy, spectral menace from outer space. Xasnu Action Comics #278 (July 1961) Alien plant-being, planned Earth invasion, empowered and mind-controlled Perry White as "Masterman" to battle Superman. The Xenomorphs Alien (1979) The Xenomorph endoparasitoid extraterrestrial species that is the primary antagonist of the Alien film series. The species made its debut in the 1979 film Alien, and reappeared in its sequels Aliens (1986), Alien 3 (1992) and Alien Resurrection (1997). The Aliens have battled Superman in Superman/Aliens, Superman/Aliens 2: God War, and Superman and Batman versus Aliens and Predator. The Xnorians Adventure Comics #294 (March 1962) Superboy enemies, teleported Smallville students to Xnor and Xnor students to Earth in involuntary "student exchange program," threatened to destroy Earth if Xnorian students were mistreated. Zaora Adventures of Superman #444 (September 1988) A Kryptonian criminal and inmate of the Phantom Zone, usually connected to General Zod. She may be a Post-Crisis variant of Faora Hu-Ul (see above). Zha-Vam Action Comics #351 (June 1967) Only appearing in Action Comics #351-353, created by the gods to defeat Superman with their powers, like Hercules' strength, and possessing a belt that gives him other powers, like transforming into a Gorgon. Zozz Superboy #81 (June 1960) Superboy enemy, tyrant of planet Xenon, where most inhabitants have superhuman powers and those who do not are persecuted and exiled. Black Zero (organization) World of Krypton (1988) A "clone liberation" movement and terrorist organisation from the planet Krypton that was ultimately responsible for the planet's destruction. The Superman Revenge Squad Action Comics #286 (March 1962) After Superboy foiled the plans of several blue-skinned criminals from the planet Wexr II, the Wexrans banded together as the Superboy Revenge Squad and plotted against him; the group's name changed when Superboy reached adulthood as Superman. Over the years, their membership expanded to include villains from several planets, all seeking vengeance against Superman for curtailing their criminal activities. Named members include leader Rava and Scout 627 (from Action Comics #287); Dixo and Vagu (Action Comics #295); Dorx and Krit (Action Comics #380); Dramx-One, Fwom, Jumrox, Klakok, and Nryana (Superman #366); Nakox (Superman #367); and Tydru (Superman #368). Adventures of Superman #543 (February 1997) A group of villains brought together by Morgan Edge with the intention of killing Superman. Their numbers in this Post-Crisis incarnation included Maxima, Barrage, Riot, Misa, the Anomaly, Baud, the Rock and the Parasite. Intergang Superman's Pal Jimmy Olsen #133 (October 1970) An organized crime syndicate based primarily in Metropolis that uses technology provided by Darkseid. The Invisible Empire Superboy #153 (January 1969) Superboy enemies, alien invaders able to disassemble their atomic structure to enter and control any objects or people, sought to possess Earth's leaders. Batman Detective Comics #27 (May 1939) As a child, Bruce Wayne watched his parents get murdered by mugger Joe Chill. Driven by this, he worked to make himself into the perfect crime fighter. He has fought Superman on occasion, most notably in the 1986 miniseries Batman: The Dark Knight Returns. Maxima Action Comics #645 (September 1989) The princess of Almerac. She came to Earth, looking for Superman as a potential mate, but he turned her down. She has been both a friend and enemy of Superman. She died during the Our Worlds at War crossover. These are Superman villains created in other media, with no appearances in previous comics. Nigel St. John Lois & Clark: The New Adventures of Superman Tony Jay The butler and confidante of Lex Luthor, who later betrays him to Intergang and attempts to blackmail Superman with knowledge of his identity. Tempus Lane Davies A time-traveller from the future who despises the peaceful society Superman created and wants to change time by killing or disposing of him beforehand. The Warlock The New Adventures of Superman Ray Owens A male witch who appeared in six episodes of Filmation's varied incarnations of Superman. His power is derived from a sorcerer's ruby, a crimson jewel fitted to his cane that casts magical energy beams. Lionel Luthor Smallville John Glover The father of Lex Luthor and a classic corrupt businessman. Baern Bow Wow A wraith that escaped from the Phantom Zone and could absorb and project nuclear energy. Aldar Dave Batista A hulking man-eating humanoid. The Titan Kane (wrestler) A bloodthirsty alien warrior looking for the ultimate opponent. Margaret Isobel Thoreaux Kristin Kreuk Lana Lang's ancestor and a witch. "Weird Al" Yankovic Not to be confused with Barton Mathis, a Batman villain who also calls himself "the Dollmaker", Anton Schott is the son of the Toyman who kidnaps children and turns them into doll-like slaves. The character was originally created for the animated series, Super Friends: The Legendary Super Powers Show, as a stand-in for the Toyman but would later go on to appear in the comic books. The character most recently appeared in the animated film, Batman vs. Robin, albeit with some of Barton Mathis' characteristics. Laurie Fraser (Lizzie) Small-time robbers. Kurt Bowman Eddie Barth A corrupt detective. Ironically realised Clark Kent is Superman moments before his execution. Earl Garver Brian Cox A mad scientist who held Metropolis ransom with a lead-covered bomb. Livewire Lori Petty A Superman-criticizing shock jock who received the power to manipulate and turn into electricity from a bolt of lightning. Luminus Superman: The Animated Series Robert Hays A scientist armed with light-based weaponry and hard-light constructs in a manner reminiscent of Mirror Master. Mercy Graves Superman: The Animated Series Lisa Edelstein Lex Luthor's faithful henchwoman, an experienced hand-to-hand combatant. The Prometheon Creature Superman: The Animated Series Frank Welker A gigantic earth-like construct with minimal intelligence and made for simple labour, absorbing heat to fuel itself. Corey Mills Xander Berkeley An outstanding officer who was selected to don a battle suit controlled directly by his neural systems, but eventually goes more and more violent as it affects him. Unity Stephen Root A huge grey blob that converts humans into mindless drones and with a crippling weakness to X-rays. Volcana Superman: The Animated Series Peri Gilpin A pyrokinetic imprisoned by the government as a secret weapon. Rescued by Superman during his series, but returned as a generic villain in the Justice League series. Superman II Ned Beatty Lex Luthor's henchman. Superman II Jack O'Halloran The mute henchman of General Zod. He has the same superpowers as Superman and Zod and sports a mustache and thicker beard than that of Zod. He obeys Zod's commands, most graphically when he hurls a police siren light at hypervelocity to kill a fleeing boy in East Houston, Idaho. Non later crossed into the comics. Superman II Sarah Douglas The female companion of General Zod. She has the same superpowers as Superman and Zod and sports short hair. She has a fascination with authoritative-appearing badges and is driven by "perversions and unreasoning hatred of all mankind." Ross Webster Superman III Robert Vaughn An industrialist trying to gain a monopoly by destroying his rivals, who turns Superman evil with tainted kryptonite. Gene Hackman (voice) A solar-powered menace born by detonating a nuclear bomb attached with Superman's genetic material in the sun. Lenny Luthor Jon Cryer Lex Luthor's nephew. Deathstroke the Terminator Lois & Clark: The New Adventures of Superman Antonio Sabàto, Jr.
Nick O'Teen created for the Health Education Council; his catchphrase is "One puff and they'll soon be in my grasp"
^ Evanier, Mark (November 10, 2006). "The Palance-Darkseid Connection". News from me. Archived from the original on December 26, 2008. ^ "Amalak". Supermanica. Archived from the original on 2010-10-22. ^ Lord Satanus may be based on the Pre-Crisis magical supervillain Lord Satanis. ^ "J. Wilbur Wolfingham". Supermanica. Archived from the original on 2011-01-19. ^ "Kru-El". Supermanica. Archived from the original on 2011-07-24. ^ "Professor Vakox". Supermanica. Archived from the original on 2011-07-24. ^ "Zha-Vam". Supermanica. Archived from the original on 2010-04-16. ^ "Jay Oliva on Weird Al Yankovic's Role In Batman vs. Robin". Crave Online. ^ ""Smallville" Legion (2009) -- Full cast and crew". IMDb.com. Retrieved May 28, 2011. This page was last edited on 24 April 2019, at 14:41 (UTC).